There are literally tens of thousands of small mines and prospects scattered around the country. Not big mines; these are small diggings – often done by one miner – that are have been abandoned for a decade. It is a common belief among some people that you need to search around a big mine to find gold. 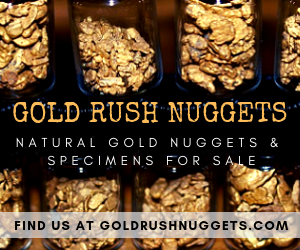 They seek out the large mines that may have produced millions of dollars worth of gold, and while this isn’t necessarily a bad tactic, they are overlooking a lot of good prospecting sites. Searching for gold around abandoned gold mines can be productive, but most of the big ones are still claimed up. If you want to work them, you will have to get permission from the current claim holder. That may not be easy. Some of the big mines are also surprisingly poor places to prospect. It really depends on the operation and the type of gold they were recovering. If all the gold was microscopic specks of gold locked up within ore then it will probably be a lousy place to prospect. Some big mines were also much more efficient, and as a result they didn’t leave much behind. These are spots where someone, perhaps 150 years ago or more, found an indication of gold and did a little bit of digging. This was a time when thousands of men were scouring the hillsides hunting for gold. In rich gold country they covered every nook and cranny of the landscape looking for natural indicators of gold. Even if the site was rich, it may not have a very big “footprint.” I have hunted spots that I knew miners recovered a good amount of gold, but the spot really wasn’t much too look at. A bit of a scar in the hillside from digging, but mostly overgrown now with brush and trees. If you didn’t have a trained eye for such things it would be very easy to miss. You might think of a tunnel in the ground or a big tailing pile hundreds of feet tall – but most mining back in the early days was much like this one. Just one miner and basic tools. Just because the mine was small doesn’t mean it there isn’t any gold there. Do They Have Any Gold? They might have recovered nothing… they might have found a few ounces and moved on… or perhaps they dug out a hundred ounces of yellow metal! We really don’t know and we never will know. These were just solo prospectors out hunting for gold just like you and me. One thing is known for certain… a gold miner needed to find a lot of gold (by today’s standards) to survive during the gold rush. 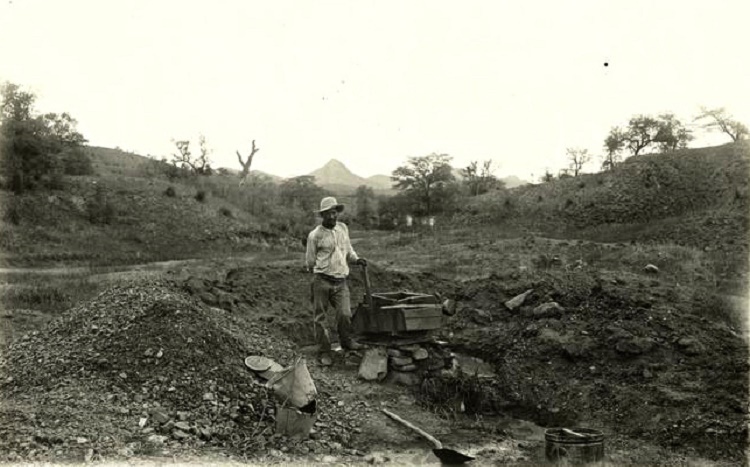 While we might be content finding a gram or two of gold per day, the early miners needed to be finding several ounces of gold just to feed themselves. If they hunted a site and it wasn’t particularly rich they would simply move on. This is what is exciting today. 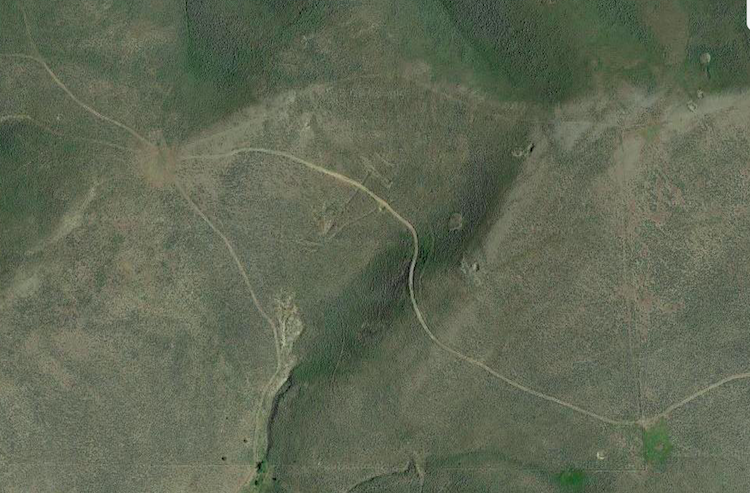 Perhaps there was a miner working a spot back in 1865. He was digging into some dirty quartz and crushing the ore, recovering 1/2 ounce of gold per day on average. There is a very good likelihood that he would move on and look for a richer site. By today’s standards, 1/2 ounce of gold in a hard days work is pretty darn good! Believe me, there are spots like that out there still, you just have to put in the work to figure out where they are. Ok, so I’ve convinced you that those smaller prospects can be very lucrative for prospectors now. How do you go about finding them? First, you want to make sure you are in a known gold district. Without any documented history of a mine, you will want to hunt in a places where you can assume that they were probably digging for gold. Maybe they were digging for something else, but if you are in a known gold district then there’s a pretty good chance that it was gold they were after. Next thing I would recommend you do is to get on Google Maps or some other type of online map program. 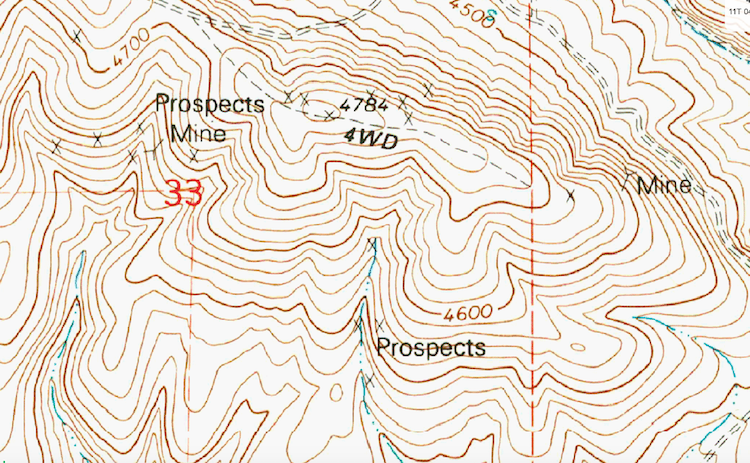 I have always liked caltopo.com because it’s easy to use. Set the overlay to USGS 7.5 and you will have really good detailed maps. It will mark some of the larger mines, big tailing piles, and sometimes they will even show small X’s that are actually the small mine prospects that you are looking for. Just keep in mind that most of them are not on any map, and they are easily overlooked. You can get some good ideas for places to look by looking at maps and aerial photos, but ultimately it takes “boots on the ground.” Some of them are very hard to spot, especially because they can be overgrown with trees and shrubs now. Good detailed topographical maps will sometimes show even small prospects. This is a great way to find good places to prospect… it will at least get you in the right area for further exploration once you are on-site. At first glance, this aerial photo of the desert might not look like much. 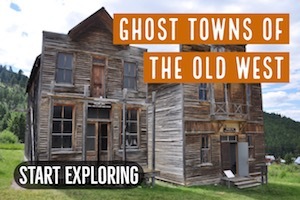 However, look close and you will see several spots that are actually old miner diggings. Is there any gold left behind? 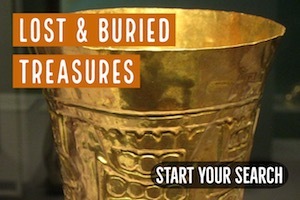 You won’t know until you visit them and do some prospecting and find out! Once you find one of these small prospects you want to hunt it and see if it actually has any gold. Remember, these little diggings might have nothing at all, or they might be surprisingly rich. You never know until you work them yourself! 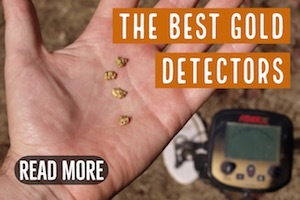 My favorite way to hunt these little spots is with a good gold detector (my favorites are the super-sensitive ones like the Fisher Gold Bug II and Minelab Equinox 800). It is common to recover specimen-type gold from the hillside diggings, pieces that have eroded from small veins. You need a really sensitive detector to hit on this type of gold. Since most of the time these prospects aren’t near water, a good drywasher can also work really well. 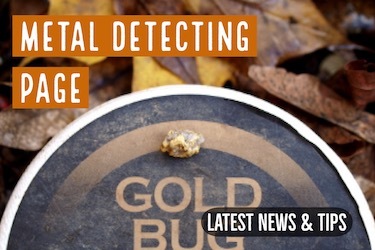 This will find smaller bits of gold that a detector might miss. I like to hunt first with a detector, and if I find that I am finding a lot of small pieces then I will pack in a drywasher to work the area. 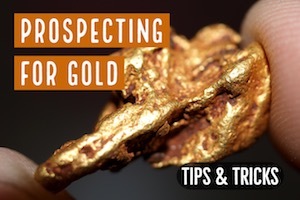 When we are talking about small mines, prospects and “diggin’s,” you have to remember that they can be just about anywhere and are easily overlooked. That is what makes them so productive even with a hundred years of prospecting activity. Some of them have simply been overlooked by others. It’s easy to find the well-known mines and the major rivers and creeks that were placer mined. These are the obvious places that other people have been working and reworking for years. 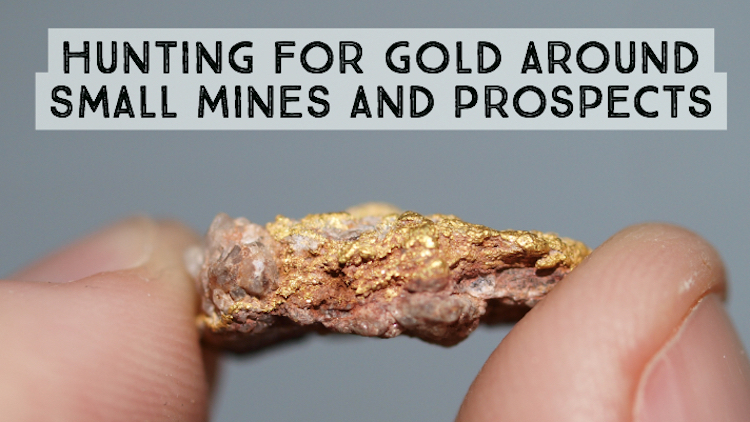 Yes, these spots still have gold, but they are more picked-over than the smaller mines. Plus, you probably know that the well-known areas are usually claimed up. By putting on a pair of hiking boots and exploring some smaller mining sites a little bit off the beaten path, you have a better chance of hitting it big and finding a really rich new gold mining location. 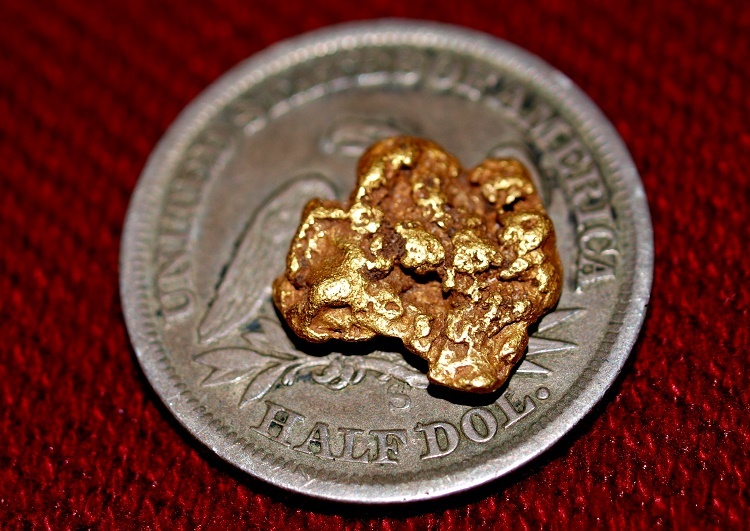 Next: Public Land Gold Mining – Millions of Acres Open to Prospecting!